All MacBook, MacBook Pro, and MacBook Air portables use a battery that has an internal processor designed to maximize battery performance. One of the functions of the battery's internal processor is to estimate the remaining battery life by analyzing the current state of the battery charge and the rate at which power is being consumed. To make accurate predictions about the remaining battery charge, the battery and its processor need to undergo a calibration routine. The calibration routine helps the processor gauge the battery's current performance and make accurate predictions about the remaining battery charge. Apple's newer MacBooks and MacBook Pros don't go through the same calibration process as its older laptops. Allow the MacBook to discharge completely and turn off. Then, plug in your power cable and charge the battery to 100 percent. During this time, macOS automatically calibrates the battery. When you have an older MacBook or MacBook Pro, you may forget all about the calibration process. It doesn't hurt the battery if you forget to perform the calibration routine; it just means you're not getting the best possible performance from the battery. However, after the battery is calibrated, its remaining time indicator is much more accurate. Over time, as the battery accumulates charges and discharges, its performance changes. The appropriate time between calibrations is dependent on how often you use your Mac. The process doesn't hurt anything, so it's safe to calibrate the battery a few times a year. Start by fully charging the Mac. Don't go by the battery menu. Instead, plug in the power adapter and charge the Mac until the light ring at the charging jack or the power adapter light turns green and the on-screen battery menu indicates a full charge. Once the battery is fully charged, continue to run your Mac from the AC adapter for two hours. You can use your Mac during this time as long as the power adapter is plugged in and you're running on AC power and not the Mac's battery. After two hours, unplug the AC power adapter from your Mac. Don't turn your Mac off. It transitions to battery power without any trouble. Continue to run the Mac from the battery until the on-screen low battery warning dialog appears. While you wait for the low battery warning, you can continue to use your Mac. When you see the on-screen low battery warning, save any work in progress and continue to use your Mac until it automatically goes to sleep because of extremely low battery power. Don't perform any critical work after you see the low battery warning, because the Mac will go to sleep before long and with no other warning. Once your Mac goes to sleep, turn it off. After waiting a minimum of five hours (longer is fine), connect the power adapter and fully charge your Mac. The battery is now fully calibrated, and the internal battery processor will deliver accurate battery time remaining estimates. 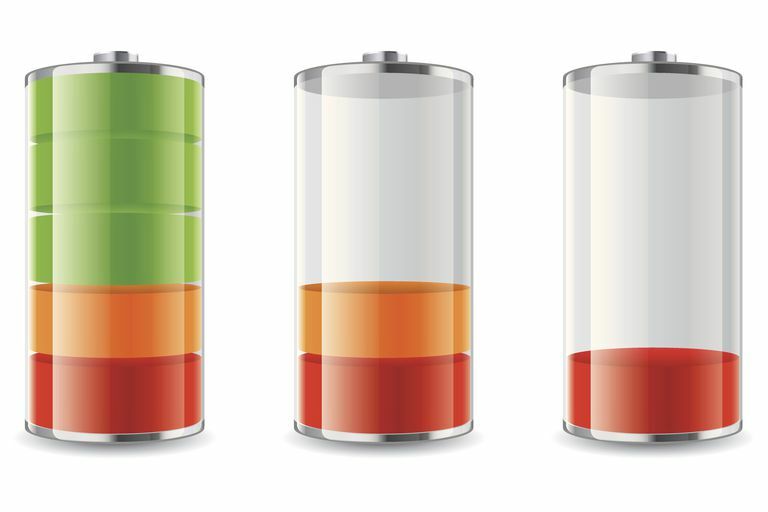 There are plenty of ways to reduce battery usage on your Mac. Some are obvious, such as dimming the brightness of the display. The brighter the display, the more energy it uses. You can use the Displays preference pane to adjust display brightness. Other ways aren't quite as obvious, such as turning off the Wi-Fi capabilities of your Mac when you’re not using a wireless network connection. Even when you're not actively connected to a wireless network, your Mac is expending energy searching for available networks to use. You can turn the Wi-Fi capabilities off either from the Wi-Fi menu bar icon, or the Network preference pane. Disconnect peripherals, including any attached memory cards. Even when you're not actively using a device, your Mac is checking the various ports for any required service a device may need. Your Mac also supplies power through many of its ports, so disconnecting USB-powered external drives, for example, can extend battery time.